Journalists make the news. Whenever duty calls their number, they are tasked to provide information no matter the situation is. It is very rare to see them as the center of the news. But in situations like this, they become newsworthy. Recently, super typhoon “Yolanda” (internationally known as “Haiyan”) wiped out the whole Visayas. The journalists who reported about the event in the field displayed extreme courage. Despite the dangers, they took the chance to help and that’s how they became heroes. Here are the lionhearted newsmen who risked their lives just for the sake of informing us. 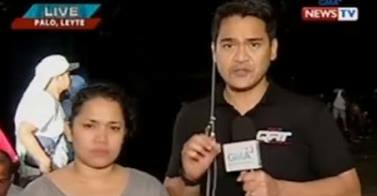 ABS-CBN News reporter Atom Araullo and News Anchor Ted Failon performed their duty as journalists when they covered super typhoon “Yolanda” in Tacloban City despite its devastating strength. While reporting outside, Araullo was nearly blown away by “Yolanda’s” wrath. The brave newsman still managed to provide information in spite of the situation. He also provided aid to the victims of the super typhoon. News Anchor Ted Failon, who was also in Tacloban, still got the job done despite the punishing rain. “There’s no word to describe this” Failon said in an interview with ABS-CBN. Despite the calamity, GMA News reporter Jiggy Manicad was in Leyte to make his report on super typhoon “Yolanda”. Manicad reported while holding several letters that the victims wrote as messages to their loved ones away from them. GMA News reporter Love Anover was also in Leyte during that time. While reporting, Anover wept that time as she was describing Leyte which is also her hometown. TV 5’s Rescue 5 Team reported from Guiuan, Eastern Samar when “Yolanda” made landfall. They took shelter inside a local fast-food chain. 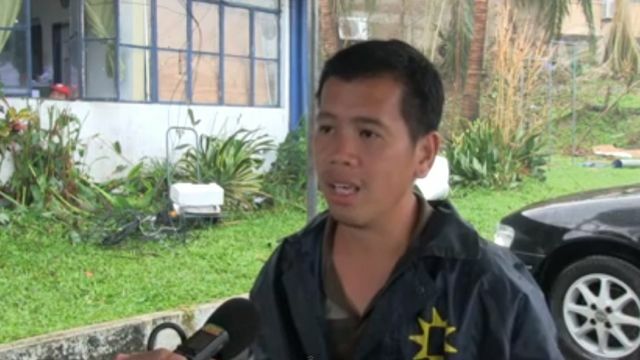 While inside, Rescue 5 member and TV5 News reporter, Benjie Dorango, made a report regarding “Yolanda’s” damage. In his report, he showed debris flying all over Guiuan’s outdoors. Solar News reporter David Santos along with his crew went missing for a couple of days in Guiuan, Eastern Samar due to super typhoon “Yolanda’s” strong winds. Santos and his crew failed to deliver a report that time because all communication lines were cut-off due to “Yolanda’s” onslaught. However, due to Santos’ sense of duty, he managed to update everyone regarding their progress via Twitter. When he reached Manila, the worn-out Santos recounts his experience through an interview with Solar News. Someone offered to buy Solar News cameraman John Alvin Villafranca‘s Facebook photos of the typhoon aftermath in Guiuan, Eastern Samar. Alvin refused the payment. Instead, he asked buyer to make a donation to the relief operations for typhoon victims. DYVL Aksyon Radyo Tacloban anchors Ronald Vinas and and Allan Medina died in the performance of his duty due to “Yolanda’s” ravaging winds. He was broadcasting when “Yolanda” struck his place. Unfortunately, he didn’t survive. He’s one of those who didn’t make it after the storm. Despite his death, due to his brave actions, he will be forever in everyone’s memories.